The 2008 Dunham Cellars Trutina is a wonderful red blend at a very reasonable price. For around $25 a bottle, the Dunham Trutina is a combination of 42% Cab, 42% Syrah and 16% Merlot. We had this with a ribeye steak and beef tenderloin and it was off the charts. It also is great by itself and has a “shelf life” when opened of about 3 days, if stored correctly. 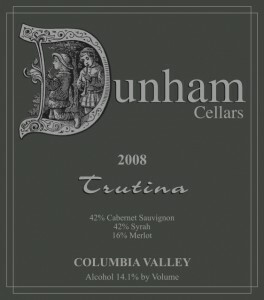 Dunham Cellars Trutina was also featured in February 2012 as an Editor’s Choice selection in Wine Enthusiast, with the comments, “….the 2008 Trutina has elevated itself beyond any previous vintage. Firm, chewy, tight and spicy, it’s a fully integrated and complex wine. Cassis, earth, lead pencil, coffee grounds and a streak of iron keep the flavors piling on. This bottle tastes way more expensive than it actually is.” We couldn’t agree more. Run, don’t walk to find yourself a bottle of this…or a half case…or a case. You won’t be disappointed. If you can’t find this locally and live in a state that accepts wine shipments, try our favorite site to find wines, Wine Searcher.